I am running a walk on Raasay for the Skye Members Centre of the Scottish Wildlife Trust on Thursday 30th June. We will start at Eyre and hope to see locally uncommon species such as Ceratocapnos claviculata (Climbing Corydalis) and Dactylorhiza incarnata ssp. coccinea , the reddish subspecies of Early Marsh-orchid. On July 9-11th I am running a BSBI Field Meeting based in Dunvegan to assist with tetrad mapping and to try and localise many interesting older records just given as “Dunvegan Head” – a large area. All welcome on both but please let me know if you are coming. More details will be provided nearer the time to those attending . Rock doves commonly nest in the coastal caves around Raasay and Skye but about ten days ago there was a pair in our garden eating stale biscuits we had put out. Now they are in the village dining at bird-feeders. Don’t they know that the route to feral pigeons has been followed before? on the outside of our kitchen window all day today. I expect it will fly tonight. Thanks to Brian Neath for the i.d. He says that there are no records in the database for Skye/Raasay since 1978! 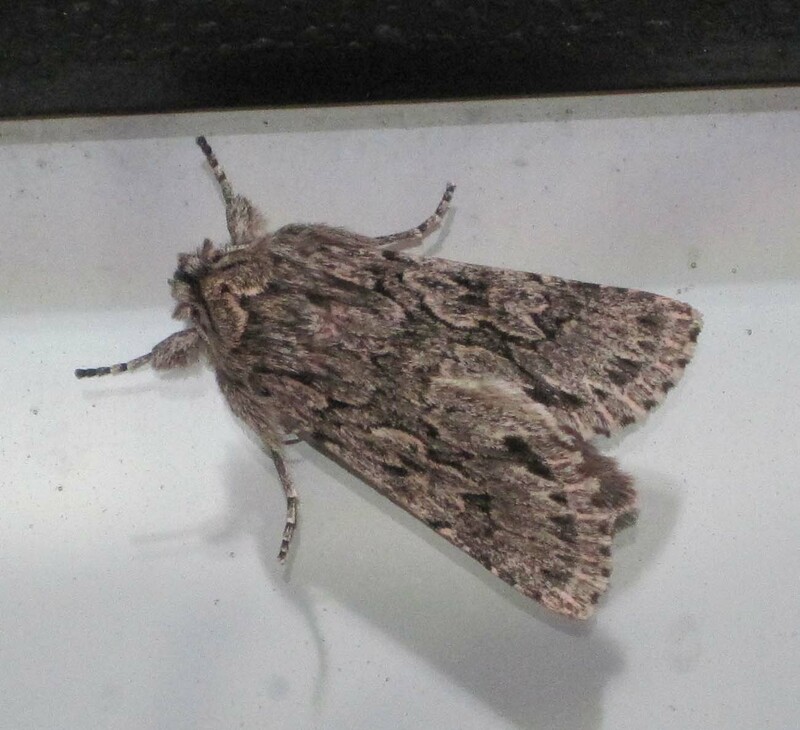 Being an early-flying species it is poorly recorded on Skye/Raasay with no residents carrying out moth trapping. Visiting moth enthusiasts tend to visit during spring and summer. His earliest record for Early Grey in Lochalsh was on 18th March 2009 so this is a good early date.